Whether you are enjoying hockey games, football games, or baseball games, this is the go-to snack sure to score with your biggest foodie fans. I tend to go crazy prepping food, just because we are a sports-loving’ kind of house! Since Game Day generally means superfoods, I headed out to shop so I can prepare my Prosciutto With Italian Inspired Ricotta Spread Appetizers. The recipe is a score with my crowd every year and I want to share it with you. Accept your Armchair Coach position as the Prosciutto With Italian Inspired Ricotta Spread Appetizer is only for those armchairs coaches that name sling, holler at the television and call out all the plays that they believe should have happened but don’t! Who is ready to lavishly live food out loud, take it to the house and deliver big on taste because this is going to score with your biggest fans! Mix Ricotta, Parmesan and Garlic Salt together, blend well. Now Lightly Sprinkle With Basil or add fresh chopped basil, your choice. Place on Platter and serve. Refrigerate if not serving immediately. Enough of the shopping adventure and onto the preparation of these delish little treats. Grab a big platter, and get ready to fill it and just as a suggestion, make a backup tray, just like there are extra players in a game in case of injury, have a backup dish ready to go! 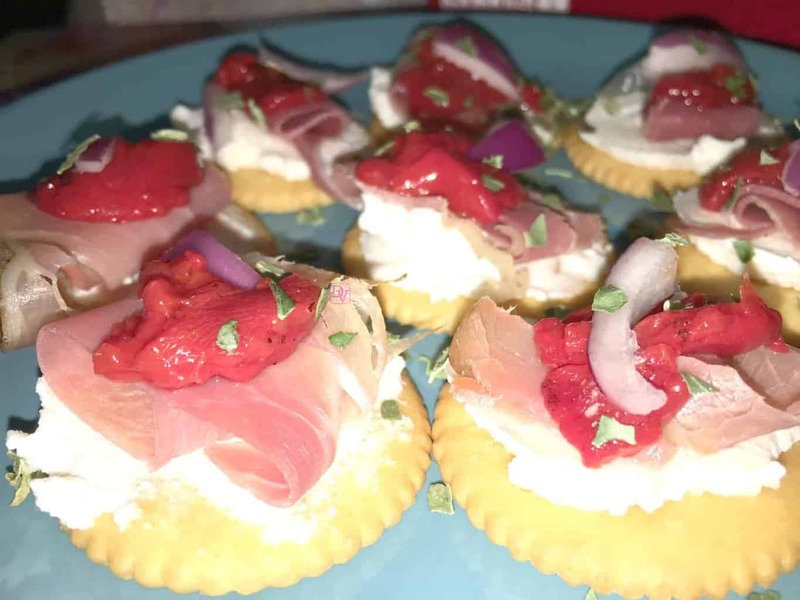 Prosciutto With Italian Inspired Ricotta Spread Appetizers are easy to make and will score with your biggest fans without a doubt. The preparation can be done ahead of time. Here are a few Cook’s Notes to think about before preparation. Buy Roasted Red Peppers in a small jar, you don’t need many, you can even buy them sliced already. Use a slotted spoon to get those roasted red peppers out of the jar and into the dish you are slicing them in. The Red Onion should be cut thin as it is just to taste. Garlic Powder does NOT taste good in the recipe, but you can add in Pepper. Don’t forget to grab Diet Coke or Coke Zero because this tastes absolutely perfect with this combination of flavors! Are you ready to lavishly live game day out loud and score more fans with your appetizers? Now that’s a fun appetizer. It would perfect for Sunday’s game. I’ll add it to my list. This is taking our game day menu up a notch! I know they’ll be a hit with my guests at our football viewing this weekend. Yep, gotta have Coke at a party. Ritz is def. good too. 🙂 The recipe for the appetizer sounds nice! I appreciate how easy this is! Yet, it’s unique so I could take it to a party and not have others bring the same thing- thanks! The appetiser looks so delicious. The way it is decorated on a biscuit makes it look more attractive. That looks like a great snack for any day of the week! That looks delicious. This will be a hit at any party. That looks rich and yummy! I really like easy recipes. Guess need to try that. That looks so yummy! And it’s quite easy to prepare. Definitely perfect for parties. These sound fantastic and look easy to make too! Great for a Super Bowl party. This is definitely perfect for this weekend’s festivities. I’m going to try it! These sound so good and seem easy to make. I might not be able to wait for game day. These would be perfect appetizers, yum! I could even see myself making a few of these for a lunch. Oh wow now this is a perfect appetizer for game day! I’ll be hooking this one up for the men in my family for sure! I am all about easy to make and easy to eat appetizers, especially for game day. These look like they would be a total win! Looks pretty easy, and light, and also delicious looking. Is it healthy…if one doesn’t scoff a bunch with that coca cola lol! I am a vegetarian but I can imagine this being a great game day snack for meat eaters. I love prosciutto! This sounds like the perfect appetizer for me! This looks so good. It will make a great appetizer for the big game this weekend. What a great easy snack idea. I love the roasted red peppers. Yum, sounds perfect for Game Day! Ritz crackers are great with everything! That sounds super yum! I love snacks like this. What a fun appetizer for Game Day! I love Italian inspired recipes, so I will definitely have to try this one soon! Great tips as well!